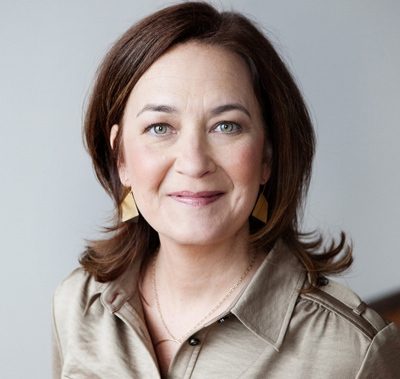 Seattle chef and cookbook author Kim O'Donnel is a long-time champion of meatless meals. She's been talking up produce-centric grub since her A Mighty Appetite food column began in the Washington Post in 2006. An early advocate of the Meatless Monday campaign, O'Donnel's first cookbook, The Meat Lover's Meatless Cookbook showcased plant-based recipes carnivores could sink their teeth into. Now, in time for the Thanksgiving feast ahead, comes The Meat Lover's Meatless Celebrations: Recipes and Menus for Everything from New Year's Eve to Summer Picnics, Birthday Bashes to Christmas. Got a holiday or special occasion dinner coming up? O'Donnel has it covered -- there's even an election night menu. The omniverous O'Donnel swung through the Bay Area last weekend and was feted at a potluck where no flesh, let alone bird, featured in a spread that was flavor filled and satisfyingly lip-smacking, as if to drive home her point: Produce can shine at any celebration. The meatless maven talked everything but the turkey with Bay Area Bites and shared some of her favorite holiday recipes too. And, relax, there's not a curd bird in the mix. Why create what you call a “feast without the beast” for Thanksgiving? I had an epiphany one Thanksgiving several years ago, when the turkey and its tofu facsimile were fighting for real estate on the table. It was a tense experience, an us-versus-them dynamic with very little tasty chow to show for all the effort. I wanted to put together a fun, festive meal that eaters of all dietary stripes could enjoy. How did you come up with a meatless menu for Thanksgiving and where's the protein? Thanksgiving is one of the easiest feasts to do meatless -- it is a harvest meal after all. We tend not to associate plants with protein -- a medium potato has 2.7 grams, 1 cup of cooked broccoli nearly 7 grams, and 1 cup of cooked spinach 13 grams. And we haven’t even gotten to the legumes -- 1 cup of cooked lentils has 18 grams of protein. A quarter cup of almonds nearly 4 grams. In your new cookbook you describe your dishes as “delicious first, meatless second.” How do you enhance flavor in vegetarian recipes? I discovered that there are lots of ingredients from the plant world that have major umami potential -- mushrooms, soy sauce, smoked paprika, roasted vegetables, tahini, to name just a few. So when I say “delicious first,” I’m referring largely to umami. This is why the squash is roasted and there are pistachios in the red rice stuffing [recipe below], and why I coat the sweet potatoes with kale pesto [recipe below]. These little touches add layers of flavor and texture, which is absolutely critical when making the case to meat lovers that vegetarian food is not rabbit food. What is your favorite meatless dish on the Thanksgiving table? I love having something raw on the table -- a salad of mixed greens with fruit (pomegranate seeds, clementine or grapefruit segments, apple or pear slices) or my raw kale salad to cleanse the palate, lighten up the meal and make sure there’s a wee bit of roughage. After all, it’s traditionally such a starch-heavy meal -- mashed potatoes, stuffing, sweet potatoes, rolls (and that’s all before the pie)! Cranberry sauce is a must for me. When I finally learned how to make it, I couldn’t believe how easy it was to throw fresh cranberries into a saucepan, sweeten them and watch them pop away and cook down, in just 25 minutes. These days, I like to sweeten them with good-quality maple syrup and the juice of a few oranges. Is there anything from a traditional Thanksgiving that you miss? The Thanksgiving feasts of my youth were pretty much pre-packaged affairs (think Stovetop stuffing, boil-in-a-bag vegetables, Parker house rolls, gravy out of a jar), but that’s what we knew, and that’s what felt wonderful. I remember the scenes more than the food -- hanging the wishbone to dry, the men in the basement playing pinochle and drinking scotch, my great aunt's enthusiastic use of Kitchen Bouquet, a brown liquid in a little brown bottle, to darken the gravy, watching my father carve the often overcooked turkey and begging him for a piece of skin and we kids always underfoot. I don’t miss green bean casserole or creamed onions out of a can, but I do miss the noise and merriment of a big family gathering. There's a lively kind of mayhem that comes when twenty people with the same gene pool gather under one roof. When I was in college, I made my first homemade cranberry sauce, which marked a turning point in Thanksgiving feasts to come. Every year, my brother Tim and I would replace one pre-packaged or processed dish with its homemade counterpart. What's on your menu Thursday? For the first time in a handful of years, I’m not hosting Thanksgiving. It is one of my favorite feasts to prepare, but I’ve been traveling for the past month which made it easy to accept the invitation of a Seattle friend, who’s a good cook. We’ll bring a few dishes from the new book, including the lentil pate for cocktail hour, the raw kale sale to ensure there are some greens on the table (what is it about Thanksgiving and the dearth of greens?) and the apple-rosemary-walnut pie with my newfangled pie dough ( a 50-50 mix of olive oil and butter). Come to think of it, I need to make sure cranberries will be on the table. If not, I’m assigning myself another job. Do you have advice for people hosting a meatless Thanksgiving with skeptics at the table? Try not to work yourself into a lather, for starters. Then honor their concerns and have something meaty on your veg-heavy table: Let the turkey eaters bring the turkey, for example. We’re dining in mixed-diet company these days, and it’s important that everyone feel respected and acknowledged. Enlist some helpers and don’t carry the load of dinner prep, serving, and cleaning. That’s no fun, and that’s besides the point. Thanksgiving can be a hoot, as it should be. After all, we’re gathering at the table with the people we love -- with food! 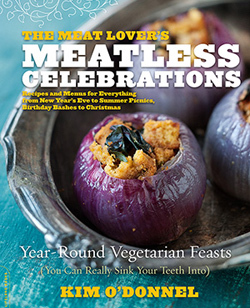 From "The Meat Lover's Meatless Celebrations"
Excerpted by arrangement with Da Capo Lifelong, a member of the Perseus Books Group. Copyright 2012. This is such a nice change of pace from the iconic marshmallow engulfed variation that has graced Thanksgiving tables for decades. Imagine, a sweet potato dish that won’t give you a sugar high! Instead, the thinly sliced tubers are slathered up with my beloved kale pesto, a green spread with both gusto and all-purpose prowess. Bring the water to a boil in a medium-size saucepan. Add 1 teaspoon of the salt, then add the kale. Cook uncovered until tender, about 10 minutes. Drain the kale under cold running water. With your hands, squeeze as much water out of the kale as possible; you’ll end up with a green ball about the size of a tennis ball. In a blender or food processor, combine the garlic and walnuts, and whiz until pulverized and well mixed. Add the kale and process until well blended; the mixture may even look a little dry. Pour in the oil and blend. The mixture should be glistening and will have a consistency that is somewhat textured, somewhat loose. Taste and add the remaining 1⁄2 teaspoon of salt, if needed. Transfer the pesto to a small bowl and stir in the cheese (if using) and the black pepper to taste. The pesto keeps well in an airtight container in the refrigerator, for up to a week. Grease the bottom of a 13 by 9-inch baking dish with the olive oil (using a brush) or with oil spray. Cut the sweet potato into 1⁄4-inch-thick slices. Place in a medium-size bowl and add the pesto, stirring until the sweet potato slices are completely coated. 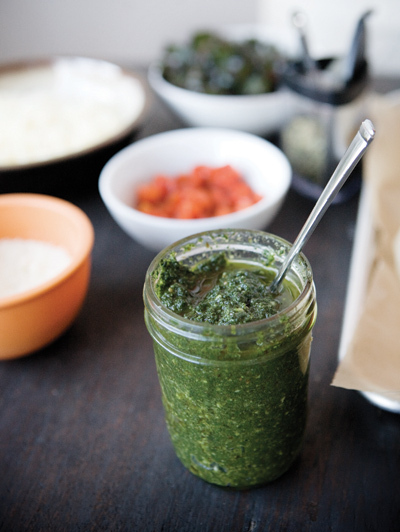 If the coverage is light, add a wee bit more pesto, in 1-teaspoon increments. Arrange the sweet potato slices in the prepared dish in overlapping fashion. You will have two or three layers when you’re done. If using the cheese, sprinkle evenly on top. Cover the dish with foil and bake for 45 minutes. Remove the foil and bake for an additional 15 to 20 minutes, or until fork tender. KITCHEN NOTES: Sweet potatoes can be large and unwieldy and sometimes difficult to cut. Sharpen your knife and cut the sweet potato in half, both in length and width, if necessary. Make the pesto first. In fact, you can make it in advance, as it keeps for several days in the refrigerator. On prepping the kale: Grab the thick fibrous stem running through the middle and simply pull off the leafy part. You can also run a knife along the middle and trim the leaf away from the stem. KITCHEN NOTES: There's enough filling for eight servings (one squash half per person). For a party of six, you'll have more than a cup of remaining filling, which you can bring to the table. Bring the water and the rice to a boil in a medium-size saucepan. Lower the heat to low, cover, and cook at a simmer, 20 to 25 minutes. The rice will be done when water is absorbed and grains are tender to the bite. Preheat the oven to 400°F and line a baking sheet with parchment paper. Trim both ends of each squash and slice in half lengthwise. Scoop out and discard the seeds and the attached pulp. Brush both sides of the squash with the olive oil, and season the inside to taste with salt and pepper. Roast until easily pierced with a fork, about 30 minutes, and remove from the oven. Lower the oven heat to 350°F. While the squash roasts, make the filling: Transfer the rice to a large mixing bowl and add the 1/8 cup of olive oil, and the parsley, nuts, dried fruit, fennel seeds, ginger, citrus zest, and chile pepper. Stir until the rice is coated with the oil and the mixture is well mixed. Add the 1/4 teaspoon of salt, stir, taste, and reseason if necessary. 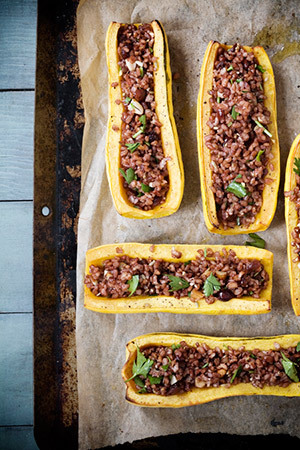 Fill each squash half with about 1/4 cup of the filling. Return to the oven and heat for about 15 minutes, until the rice is warmed through. Serve immediately, or lower the oven temperature to 225°F, cover with foil, and hold until ready to serve.